Sitting in the messy living room of a Park Slope brownstone 11 days before he was scheduled to take the stage with Andrew Cuomo in the only televised debate in this year’s New York governor’s race, UPS truck loader Howie Hawkins pondered how he would best convey his energy policy in 60 seconds or less. Hawkins, who is running again this year as the Green Party candidate for governor, dove into the topic by describing his plan to convert the state to 100 percent renewable energy sources in 15 years. This plan, he insisted, would address climate change, generate millions of new jobs and cut electric rates in half. So what was a better approach? “You don’t want to be robotic,” said one advisor. “He wants to be conversational,” said Green Party State Co-Chair Gloria Mattera. “He wants to be charming,” added a longtime friend of Hawkins. “And seductive,” Mattera chimed in again. “Well, think it about 20 more times,” Hawkins' friend said. Actually, Hawkins and his supporters have quite a lot to be smiling about, as he has emerged as the surprise story of this fall’s otherwise desultory race for the most important political office in the state. The Greens have existed on the farthest margins of New York politics for most of the past two decades, rarely cracking one percent in statewide races. They also remain stigmatized in some liberal circles for Ralph Nader’s role in helping to tip Florida and the 2000 presidential race to George W. Bush. Yet, by mid-October Hawkins, who is on unpaid leave this fall from his job at a UPS shipping hub in Syracuse, had climbed to 9 percent in statewide polls. He also began to pick up an unprecedented string of endorsements from several liberal Democratic Party clubs in New York City and a half-dozen teacher union locals across the state, including the Buffalo Teachers Federation, as well as a handful of minor Democratic Party officeholders, all of whom share a deep disenchantment with the incumbent governor. “Astorino has hit a ceiling. Cuomo is going down. 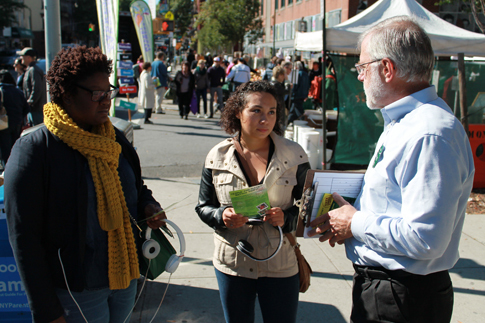 And, we’re going up,” Hawkins crowed while introducing himself to voters outside the Park Slope Farmers’ Market. Hawkins’ debate prep session was squeezed into the middle of a hectic Sunday three weeks out from Election Day. In addition to debate prep and a trip to the farmers’ market, the candidate would meet with members of a liberal Democratic club considering its first-ever endorsement of a non-Democrat and attend three house parties thrown by supporters, all while being followed around by this reporter. The candidate’s platform — a ban on fracking, a $15 minimum wage, a substantial increase in taxes on wealthy New Yorkers, a single-payer health care system, fully funded public schools and an end to high-stakes standardized testing — smartly combines environmental and social justice themes in a way that allows him to reach more voters. The centerpiece of Hawkins’ campaign is a plan for a “Green New Deal” that would use revenues from substantially increased taxes on the wealthy to bankroll the state’s transition to 100 percent renewable energy sources by 2030. Hawkins says his plan, which is based on a peer-reviewed report by Stanford professor Mark Jacobson, would create 4.5 million new jobs and end unemployment in the state. “When you keep reminding people about the Green New Deal, you remind them of what the Democrats no longer are,” added Tony Gronowicz, a historian and former Green Party mayoral candidate in New York City who teaches at Borough of Manhattan Community College. In contrast to generic corporate politicians like Cuomo and Rob Astorino, the Westchester County executive who is running as the Republican nominee, Hawkins’ biography is rife with interesting paradoxes: He is an Ivy League-educated Teamster, a socialist who has started and run small businesses that installed solar and wind energy systems and a blue-collar guy who is a serious policy wonk. “His mind is like a file cabinet,” says Mitchel Cohen, a longtime Green Party activist who has known Hawkins since they worked together in the anti-nuclear power movement of the 1970s. Yet beneath the candidate’s unconventional biography is a man whose belief in independent left third-party politics hasn’t wavered over five decades. “The richest 1 percent already own the two major parties. It’s time working people had one of our own,” Hawkins is fond of saying. Hawkins, 61, was raised in a single-parent household in a multiracial neighborhood in San Mateo, Calif., just south of San Francisco. He still speaks with a twang he acquired from the neighborhood kids he grew up with, whose families had moved from the South during the war to work in the Bay Area shipyards. Captivated by the civil rights protests of the early 1960s, Hawkins caught the third-party bug in 1964 at the age of 12. At that year’s presidential nominating convention, the Democrats had refused on national television to seat the Mississippi Freedom Democratic Party, which was led by poor and working-class blacks in opposition to that state’s official all-white Democratic Party. The Republicans, meanwhile, were already going into backlash mode against the early gains of the civil rights movement. The young Hawkins was dismayed. “I asked ‘Where’s my party?’” He recalls. He spent the next 20 years looking for it. His political odyssey included stints working on behalf of the Peace and Freedom Party, which ran Black Panther Eldridge Cleaver for president in 1968; the Citizens Party, which ran the ecologist Barry Commoner in the 1980 presidential election; and the Liberty Union Party in Vermont, where Senator Bernie Sanders got his start in electoral politics. In 1984, Hawkins co-founded the Green Party of the United States and settled into what has become his permanent political home. “I see the Green Party as the political expression of the New Left of the ’60s,” Hawkins said. If that’s the case, the Greens have inherited a complicated legacy. The ’60s-era social movements triggered a cultural earthquake in terms of how our society thinks about race, gender, sexuality, military conscription, health, nutrition and more. At the same time the Left has struggled over the past four decades to gain even a small foothold in electoral politics. While some radicals, such as Chicago 8 defendant turned California state legislator Tom Hayden, eventually gravitated back to the leftish wing of the Democratic Party, Hawkins has refused to compromise with the two-party system. For Hawkins, the Left’s undoing can be traced back to its decision to align itself with the “progressive capitalists” of the Democratic Party at the height of the New Deal in the 1930s. Creating a popular front to oppose the far right — originally conceived as a temporary expedient in the run-up to World War II — has hardened over the decades into a permanent, unthinking reflex that, in Hawkins’ estimation, has debilitated the Left in the United States. Hawkins has more than maintained his own political voice — running for public office 20 times in the past 21 years. 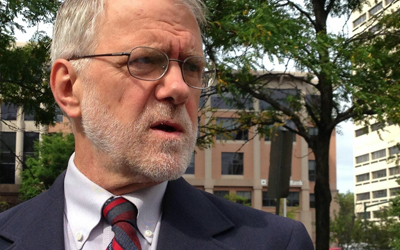 He has campaigned for everything from Syracuse City Council to U.S. Senate. So far he is 0 for 19. In 2010, he garnered 60,000 votes in the governor’s race and won a much-coveted ballot line for the Greens. A year later, he narrowly missed winning a Syracuse City Council seat in 2011, losing by less than 100 votes. And now, there is this year’s breakthrough. In addition to the 9 percent statewide support, there are polls showing him running at 10 to 20 percent in some upstate congressional districts and 24 percent in Syracuse. Hawkins’ rise this year has been propelled in good part by the hot-button issues of public education and fracking. In both cases, the governor’s policies have evoked a visceral response from constituents who fear that vital common goods — public schools on the one hand, clean air and water on the other — are on the verge of being ruined in order to enrich powerful private interests with close ties to the governor. This frustration wasn’t hard to find at the first two house parties I attended with Hawkins. “Being a public school parent has really politicized me. I’ve never felt so disenfranchised,” said Kemala Karmen, a mother of two children enrolled in Brooklyn public schools who also cited Cuomo’s refusal to ban fracking as a reason she supports Hawkins. For Karmen, the governor’s refusal to back off on standardized testing of children in early grades was especially infuriating. “He has completely failed on public education,” she said. To Rosalie Friend, a retired educational psychologist, the final straw was Cuomo’s full-throated support for Wall Street-backed charter school operator Eva Moskowitz earlier this year, during Moskowitz’s confrontation with Mayor Bill de Blasio over his refusal to grant three of her privately run schools access to public school buildings that were already fully utilized. The fight ended with Cuomo strong-arming a measure through the State Legislature that requires public schools to house charter schools free of charge or for the Department of Education to cover the rent for charters that have to find their own buildings, depriving cash-starved public schools of much-needed funding. “He [Cuomo] doesn’t publish his own schedule. He doesn’t interact with his constituents. He’s not available to us,” added Susan Weltman, a retired social worker who voted for Cuomo in 2010 but is supporting Hawkins this year. At both house parties, Hawkins urged attendees to donate to his surging campaign, noting that the average Hawkins donor gives $70 vs. $7,000 for the average Cuomo donor. In his first appearance, he briefly referenced his 1964 political epiphany before drifting further back in time to discuss 1944 and Franklin Roosevelt’s proposed Economic Bill of Rights and how his ambitious plans to convert New York to renewable energy would fulfill the promise of FDR’s vision with a green twist to address climate change. As Hawkins continued, the eyes of his supporters in the room started to glaze over, but they stuck with him and heard him out. Chided afterward by Mattera for giving a “history lesson,” Hawkins was clear and direct at his second appearance, sharing more of his personal story about how his political convictions took shape under the influence of the civil rights movement and relating that to the present moment and the rationale for his third-party candidacy. Anti-Cuomo sentiment has been running strong on the Left all year. The labor-backed Working Families Party (WFP) briefly considered running an anti-Cuomo candidate on its ballot line in the spring. In the end it bowed to pressure from its Democratic Party allies to once again put Cuomo on its ballot line, which minor parties are allowed to do under New York election law. “It’s a way for liberals to feel good about voting for conservative Democrats,” Hawkins says. WFP’s cautious decision rankled many of the party’s rank and file. Party leaders insisted, however, that cutting a deal with the governor was the smart move that would give WFP more influence in a Cuomo second term. As Hawkins fills the void on the Left, WFP now faces the prospect of being routed by a party it has long regarded as irrelevant. Cuomo’s decision to bankroll the newly formed Women’s Equality Party (which gave him its ballot line as well) complicates matters further. In a worst-case scenario for WFP, its vote total in the governor’s race could drop below the magic threshold of 50,000 votes needed to maintain ballot status for the next four years. The former WFP staffer questioned whether the Greens have the will and the organizational capacity to take advantage of a strong showing this election to build a party that can bring about real change in a state that has endured decades of misrule and corruption on the part of both Democrats and Republicans. Hawkins will almost certainly be headed back to his overnight job at UPS. Going forward, he sees the Greens taking root as the second party to the Democrats in parts of the state and continuing to build from there. Other top state party leaders also insist that party-building work will continue after the voting is done. Meanwhile, Hawkins hopes his days of being seen as a fringe candidate are over.